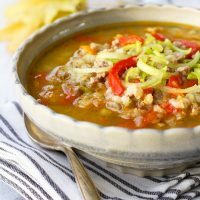 Wouldn’t it be nice to come home in the evening and warm your hands on a comforting bowl of soup, the kind of soup that is filling enough to eat as a meal and you can feel good about serving to your family? In today’s post, you will learn how to cook a big pot of a perfect low glycemic soup using ingredients you will, with a little bit of planning, always have on hand. 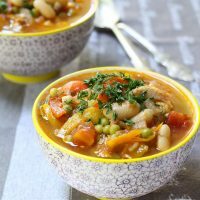 You will need a big saucepan with a lid because low glycemic soups have quite a few ingredients and you want them to fit in the saucepan and not go over the top in the middle of cooking. I use a 5 liter/20 cup/5.28 quart stainless steel saucepan and love it. 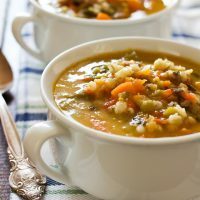 Hearty low glycemic soups keep well in the fridge for up to 5 days and are also perfect for freezing individual portions. The idea is to cook a big batch to last you for a few days, so you don’t have to worry about cooking every single day. You can also cook two different kinds of soup at once and just freeze them so that you have some variety. Choosing the liquids is very important because they make the base of your soup. I usually base my soups on a stock, diced tomatoes, or both and almost always add some water. I prefer vegetarian stock to beef or chicken – I will explain later why (see step # 5). However, when I cook let’s say a chicken soup, I use chicken stock. It’s always best to use homemade stock, but if you don’t have any on hand, it is fine to use a store-bought kind. Just make sure to buy broth without any strange ingredients such as artificial colorings or preservatives. You just want to see vegetables and spices on the ingredient list. When shopping for diced tomatoes, it is always best to buy the ones that come in BPA-free cans. 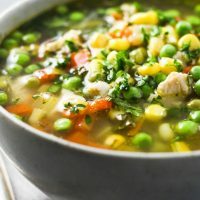 They cost just a couple of cents more but are much healthier compared to the regular ones – you really don’t want any unwanted ingredients in your soup. Start with onions or leeks. They will add flavor and nutrients to your soup. Saute them over low to medium heat in a couple of tablespoons of olive oil and then add some grated carrots and chopped celery stalks. 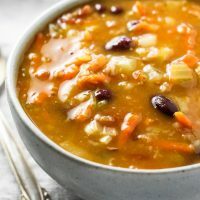 Other vegetables that taste great in soups are red peppers, butternut squash, zucchini, cabbage, pumpkin, sweet potatoes, corn, green peas, green beans, cauliflower, etc. See what’s in season in your region and experiment to find your favorite combinations. An important note – try not to overcook your veggies. If you keep your veggies slightly crisp and undercooked, they will taste better and keep more nutrients. The low glycemic whole grains I usually use in soups are barley, bulgur, quinoa, or wild rice. Make sure to pre-soak wild rice preferably overnight because it takes a lot of time to cook. For more info on low glycemic whole grains check out this post. I am not a vegetarian. However, when it comes to low glycemic soups, I prefer to cook them without meat. 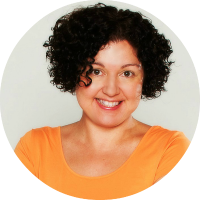 Earlier this year, I completed the Vegetarian Nutrition course at the Alive Academy of Natural Health, and I was amazed at all the health benefits of the vegetarian diet. I am now choosing to eat more plant-based dishes, and I think that low glycemic soups taste wonderful without meat. This is also why I mostly choose vegetable stock as a base for my soups. Legumes are an awesome source of protein and perfect for soups. There is a wide variety of beans, lentils, and peas to choose from. I suggest you try different kinds to find out what you like. In my family, we use a lot of black and red beans, chickpeas, and yellow peas. It’s better to use dried legumes. 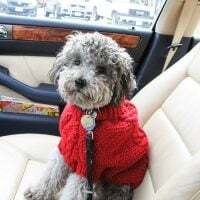 But they have to be presoaked for at least 8 to 12 hours in advance, and I have to admit that I am not always that well-organized so I often use canned beans and chickpeas. As with diced tomatoes, it’s always best to buy the ones that come in BPA-free cans. You can play around with flavors using different spices. Experiment and find what you like. Some popular spices that are often used in soups are cumin, cayenne pepper, coriander, garlic powder, dried oregano, dried basil. etc. Adding fresh lime or lemon juice is also a great way to add more flavor to your soup. A note about salt – we really don’t need more salt in our diet, but you also don’t want your soup to taste bland. The best way is to have just enough or slightly less salt than you are used to. If I use store-bought stock, I usually don’t even add more salt because it always seems just enough for my taste. Diced tomatoes also often have salt in them so keep tasting the soup to make sure you don’t add too much salt. When I say greens, I mean green leafy vegetables like kale or spinach and fresh herbs such as parsley, cilantro, dill, chives, etc. I like adding a lot of herbs into my soups. I think they add a wonderful flavor to any dish. Add greens at the end of cooking just before or right after turning off the heat. I hope you found these tips helpful. 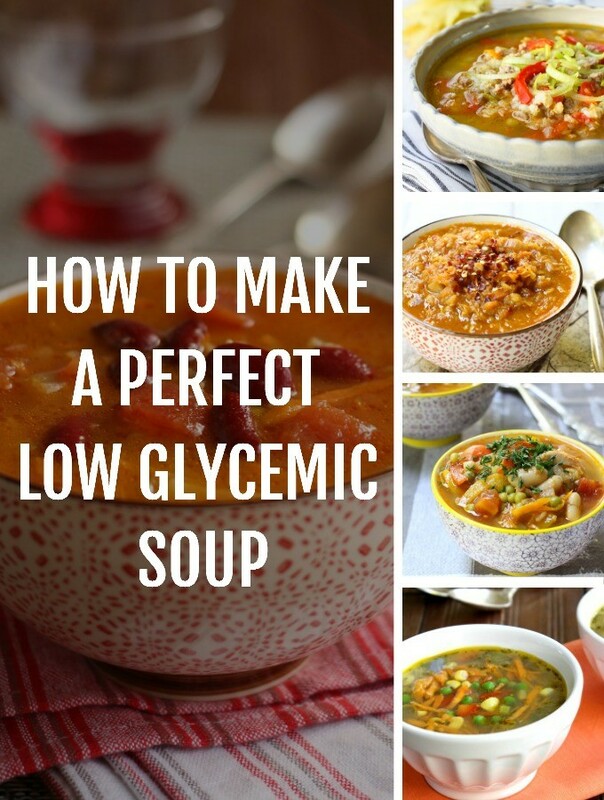 If you want to share with us your favorite low glycemic soup ideas, I am inviting you to leave a comment below – I would love to hear from you! If you are interested to check out the low GI soup recipes available on my blog, please click here. To learn how to set up a low glycemic pantry – click here. 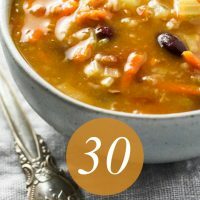 You might also like to check out this list of weight-loss soups. Hi there, not sure what soups you are referring to. The nutritional facts will depend on the particular ingredients and the quantities of the ingredients used to make the soup.